A while back, I came across a photo of the Flock of Starlings wall hanging posted on the The Quilted Fox blog. 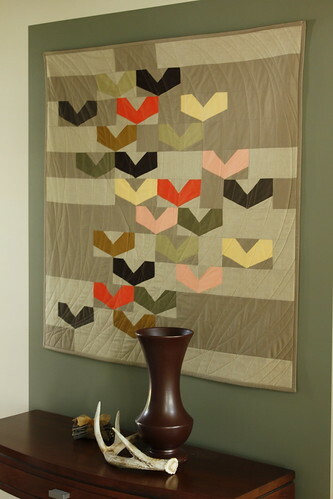 Appreciating the quilt's fresh appearance and the clever simplicity of the starling block, I was instantly in love, and "faved" the image for future reference. After more than a year, my affection for this wall hanging never wavered, so much so that I decided to make one for myself. 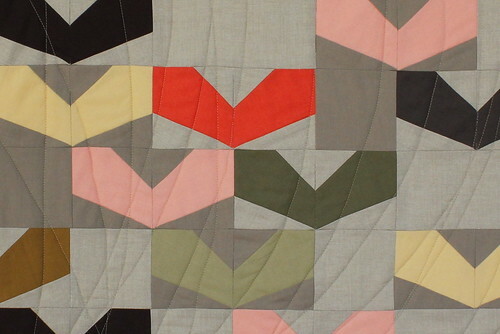 The individual starling block was designed by Quilt Dad, who was kind enough to post this link to the pattern for those of us who are interested in making our own. Despite it being dead simple to make, this innovative little block evokes the motion of flight. 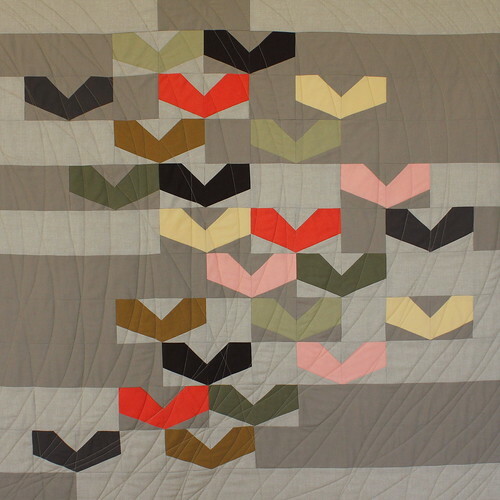 Combined with sweeping contrail-like quilting lines, there is no mistaking that this is a swift moving flock. My wall hanging measures 36" square. I reduced the individual finished half block size from 6" to 3" square, making the overall design 12 blocks high by 12 blocks wide. I like how this flock of starlings brought my hallway to life. Fortunately, these fabric birds are much more quiet than the real ones! This is so beautiful! Perfect for your wall! I just love this! It's so striking! I just love your version - the colors and placement are stunning.